Intense Driving Courses, Yes Or No? Home > Driving Lessons > Intense Driving Courses, Yes Or No? 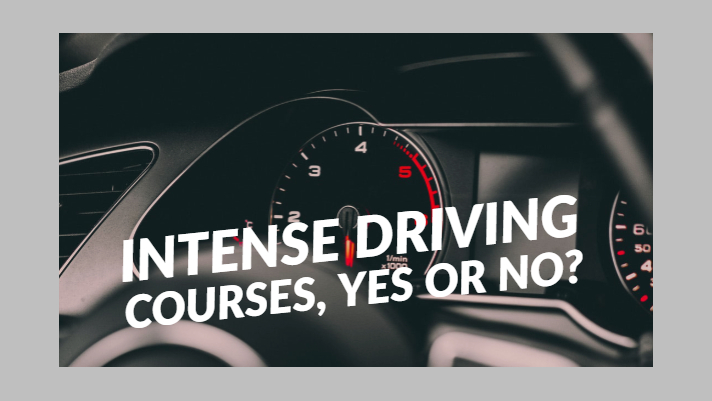 20 Feb Intense Driving Courses, Yes Or No? There has been a lot of debate since the introduction of intense driving courses, and there are also a number of misconceptions that surround them. The biggest one of these is the image of a learner taking their driving test over and over again until they pass on the same day – this is simply not true! While the driver can take their test repeatedly, they will usually be subject to the same waiting periods as other students. The main element of these courses is taking many hours of tuition, and cramming them all into a short space of time i.e. a week or a month. The biggest advantage of an intense course is that for the right kind of learner, it is possible to get up to the required standard without having to spend a year or longer on the road beforehand. Specialised instructors devise a lesson timetable that covers all of the major driving test requirements, and the learner will usually take a ‘mock test’ within this week as well. If the driving school can offer some sort of ‘pass guarantee,’ package, this can actually work out cheaper than courses over a long period of time (it is essential to read the terms and conditions thoroughly!). On the other hand, critics of intensive lessons believe that the student is simply being taught to pass an exam, as opposed to being a safe driver. This is a problem in all aspects of our education system, and it is equally possible to simply throw enough money into driving lessons to achieve a quick pass. From a practical point of view, one week of intense lessons during the summer could offer zero experience in inclement weather conditions, which in turn produces a qualified driver that is incapable of handling wind, rain or snow on the road. Overall, it probably makes sense to combine these two methods of learning. A failed test could be a great time to use an intensive course to brush-up before the next exam, as the individual will have a level of longer-term experience on the road.